Mental health disorders are debilitating conditions that affect hundreds of millions globally. This course will introduce the genetics and epigenetics associated with the manifestation of mental health disorders, focusing on anxiety disorders and schizophrenia. It will discuss disorder aetiology, heritability, environmental aspects and the interaction of these in terms of manifestation and subtypes of disease. The course does not aim to answer all the questions surrounding the molecular aetiology of mental health disorders, but to present current views on these conditions. It will show that researchers may be asking the ‘right’ questions with regard to future developments. Bantjes, J. et al. 2017. Monitoring outcomes is key to improving mental health treatment in South Africa. McGregor,N. 2015. New gene links to schizophrenia could open the door to improved treatments. McGregor, N. 2015. Seven new genes linked to anxiety disorders. Ngomi, N. 2016. Why African genomic studies can solve the continent’s health issues. Ramsay,N. 2016. Understanding Africa’s diverse gene pool can help fight lifestyle diseases. 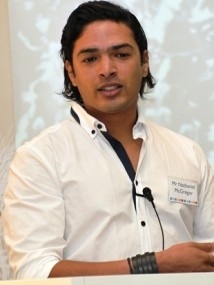 Dr Nathaniel McGregor is a neuropsychiatric geneticist specialising in the molecular etiology and pharmacogenetics of mental health disorders, specifically anxiety disorders and schizophrenia. His focus is on the genetic and epigenetic contributions to disorder psychopathology. He collaborates with the Psychiatric Genomics Consortium (PGC) and the Global Initiative for Neuropsychiatric Genetics Education in Research (Harvard & MIT). Currently he is in charge of the Human Genetics subdivision in the Department of Genetics at Stellenbosch University along with Prof Louise Warnich, Dean of Science.